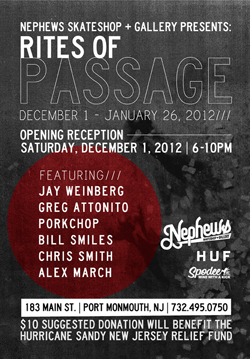 The opening reception for next show "Rites of Passage" will now be held on December 1, 2012. 6-10pm. As all of you know, we had to reschedule due to the storm. Hurricane Sandy hit out area pretty hard. Some of our favorite beach spots no longer exist and many of our friends and neighbors lost everything they had. The night of the opening we will be asking for a suggested donation of $10 that will go to the Hurricane Sandy New Jersey Relief Fund. We hope to have a raffle to benefit the relief fund as well. I hope you all can make it. Should be a fun night!